I awoke a little earlier than usual just before 5am with my routine morning call of nature. I walked down to the restroom quietly expecting to be the only one awake and who do I run into…Cindy of course! She was already up and checking the food coolers to make sure everything was in order. I went back to bed a bit and did some blogging before I went back downstairs. 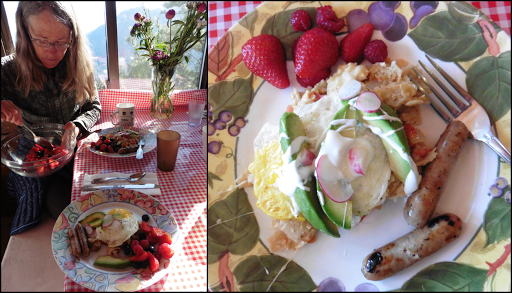 Most everyone was up and many were in the kitchen helping to prepare breakfast. 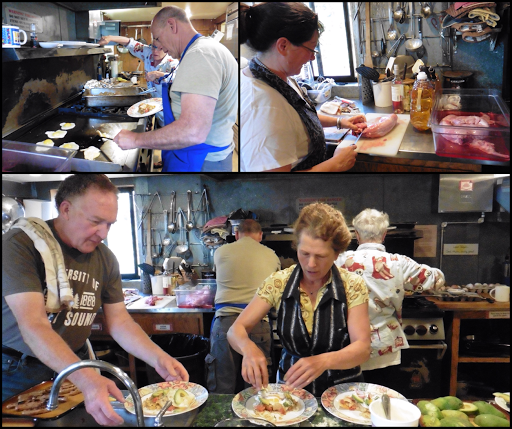 It was like being in the kitchen of a restaurant with everyone moving quickly and with purpose. Watching it all happen is like watching a choreographed dance! Free Range’s sister was even cutting up home raise rabbits that they were going to have for dinner…again all of this is being done in a lodge and everything was brought in coolers for the entire week. I can’t even imagine the planning and organization that had to go into that…and I worry about buying for a measly four day resupply, ha! As we packed up, everyone in the lodge was headed to their respective activities for the day. Some hike, some bike, some kayak. The long food table had all the fixings for lunch sandwiches with some delicious corned beef and we each made a sandwich. What a wonderful week of vacation and celebration for them! We took one last photo with Free Range, Cindy, and John before Free Range took us back to trail. 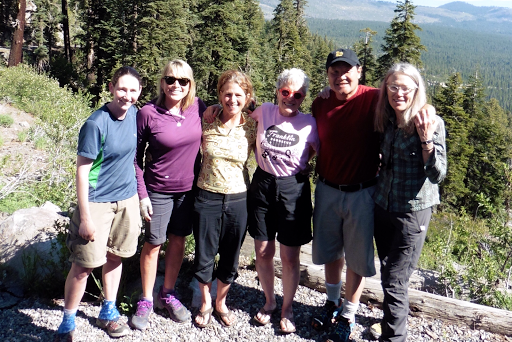 Again, THANKS SO MUCH to Free Range and her family for inviting us and giving us the BEST TRAIL MAGIC EVER! 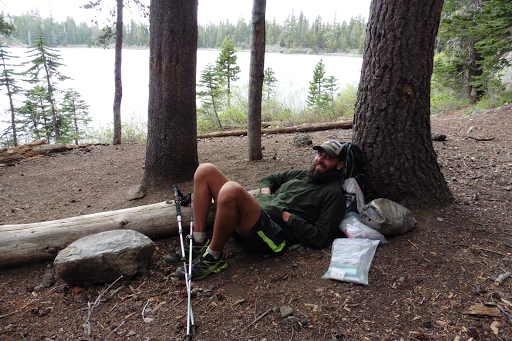 At Echo Lake, there were more PCT hikers there getting resupplies organized and I saw a fellow PCT 2011er, Mr Furious who was out to thru hike again. We all chatted with the hikers for a bit and finally got back on trail at 10:15am. It was a nice leisurely start to the morning, but we knew we had quite the climb ahead. It was a consistent up, but it was cloudy with and 80% chance of rain/storms and we were thankful for that because it could have been brutal in heat. 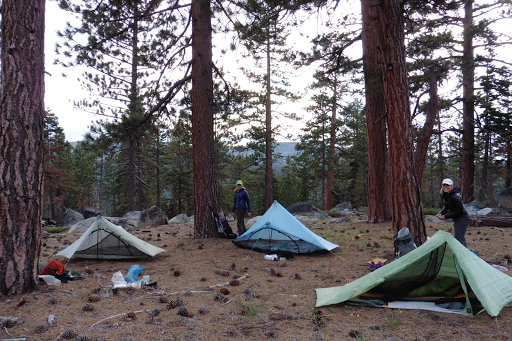 We were still overlapping with the PCT for about 15 more miles and in the few hours before lunch, we ran into 15 thru hikers. 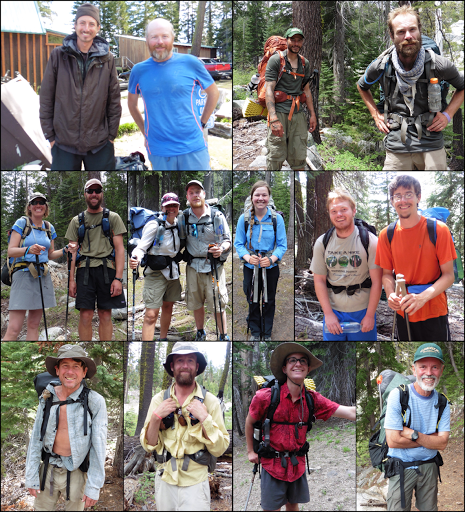 We had brief conversations with all of them and it was tough to keep stopping, but it was fun to find some connections in there and meet some more of this class of hikers. I’ve always thought of a southbound PCT hike for more solitude and now realize how hectic it could be through Oregon and California running into so many northbounders! L to R, Top: Rocky Point, Mr Furious, Kmart, Flyin Fish, Middle: Karen, Raymon, Eskimo, Snickers, Fluffy Star, Freedom Train, Misery, Bottom: Bogie, Whiskers, Oatmeal, Go Ducks. 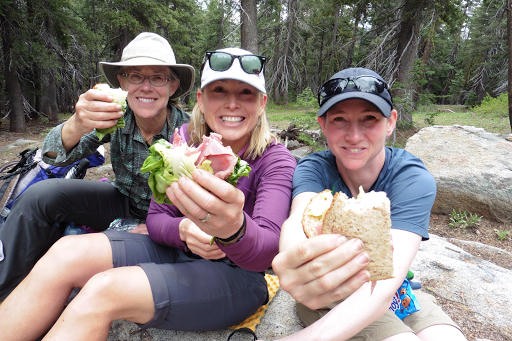 Once we got to the top of the climb, we rewarded ourselves with our sandwiches from the lodge. They were great! 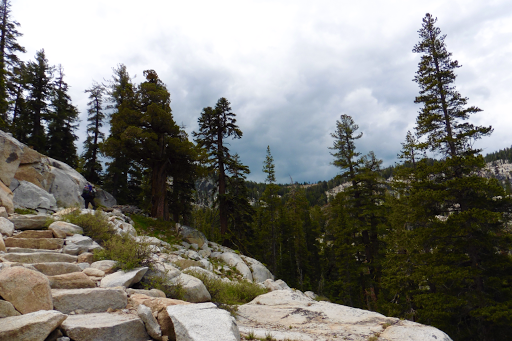 The clouds loomed all day and it would rain lightly from time to time, but we fortunately dodged are rain and storms. 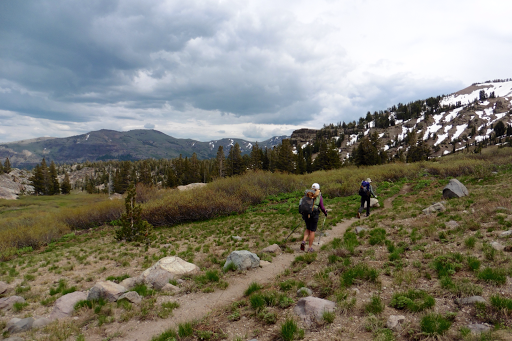 The section we hiked through made us think of the CDT in Colorado with the storm clouds, patches of snow on the surrounding mountains, and expansive views. 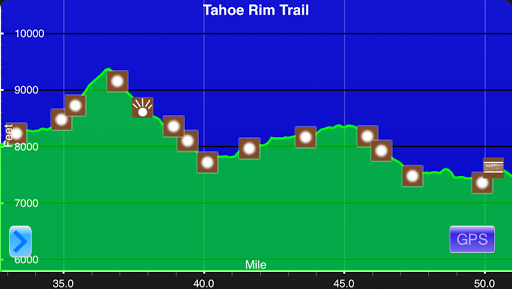 As we dropped back down, we got to Round Lake and ran into TRT thru hiker Clutch. It’s a small world, but Clutch is actually from Portland and was just two weeks ahead of me on the Hayduke. We knew before the hike we’d both be on the HDT and didn’t get a chance to meet before. He had planned to be on the Sierra High Route right now and is waiting for the snow to melt, so he figured he’d jump on the TRT. Such a small trail world we have! We hiked later than we planned to get the miles in so we could finish tomorrow with under 23mi left to hike. We had gotten a late start this morning and stopped to chat with all those thru hikers, so progress was delayed today. We were focused on pushing to camp when around 6pm, Why Not saw a morel mushroom right next to the trail. 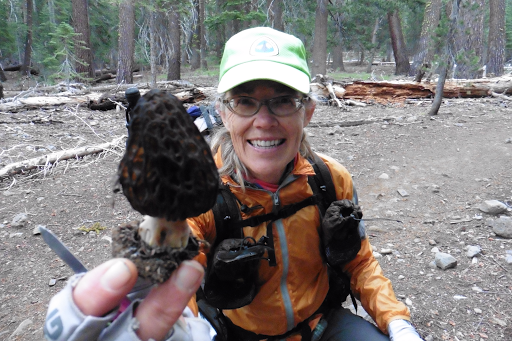 She has gotten into mushroom hunting in the last few years and a morel is quite the find! They are so rare that they go for $40/lb in stores. We looked around and noticed many more in the immediate area…and then more along the trail as we hiked! Since we are hiking out tomorrow, Why Not went ahead and gathered them to take them home. She carried them in her head net and we found 22! Why Not was like a kid on Christmas and it was really entertaining to watch! 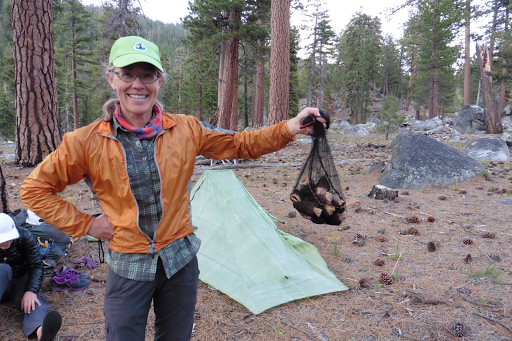 This mushroom hunting made our last few miles go quite a bit slower than expected, but it was worth it! We hiked passed highway 89 near the public Luther Pass Campground and wanted to get far enough in to be out of sight and mostly sound of the highway. We ended up finding our best site of the trip! Flat spots in super comfy over sized pine needles. We set up prepared for almost definite rain overnight. I’m up late blogging and the rain started to come down around 10:30pm. It’s after midnight and still coming down steadily. Rain is expected for tomorrow too and it’s nice that we’re hiking to the cars and dry beds!